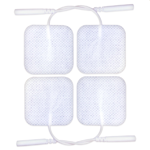 Unlike other skin electrodes that can cause hot spots and nipping, our ultra-high quality 50x50 Reusable Electrodes are designed to be easy and comfortable to use. Perfect for use with Kegel8 Ultra 20 or Kegel8 V For Men, these electrodes are reusable. 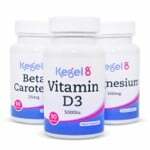 Simply peel away from the plastic backing and apply to clean, dry skin as recommended in your Kegel8 User Guide. If cared for as per the instructions included with the electrodes, the electrodes can last up to 4 weeks if used daily. The electrode backing is made with a low-allergy conductive gel which makes them comfortable to use and ideal for those with sensitive skin. 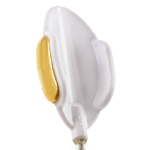 The 50x50 Reusable Electrodes attach to your Kegel8 unit via your leadwire – simply attach and use as per your User Guide. These reusable skin electrodes are manufactured to the highest quality standards and are designed to last up to 4 weeks if used every day. After which time they may begin to lose their adhesiveness. To make them stick for a little longer you can dab a bit of water on to the adhesive side of the pad – this should give you a little more use. We also recommend you cover the adhesive pad with the packaging they come with and store them in a cool, dry place.